Dave Drewery of Van Linda Iron Works and Ken Knight of Knight Welding Supply speak to PBSC dual enrollment welding students Kerry Mullins, Jr., Arman Irons, Dioby Cherisme, Katelyn Finch, Schinay Joseph, Robert Curtis and D’aujalonne Scarlett. The program was launched for high school students last fall, but has finished the year strong with nine students enrolled in the program from Pahokee High School and Glades Central High School. This collaborative effort between the School District of Palm Beach County and Palm Beach State College will allow students to graduate high school with at least a Level 1 National Center for Construction Education and Research (NCCER) welding certification, which is an internationally recognized credential.To ensure their training programs are aligned with the employer’s needs, PBSC’s business partners loan equipment that the students troubleshoot and repair until it meets the industry standard. “Our business partners know that when they hire a student from our program, the student has had troubleshooting and repair experience on equipment they may encounter in that workplace, and the student has the skills to do the work required,” said Palm Beach State College Program Director Dr. Gloria McAllister. Student Katelyn Finch gets tips from Ken Knight of Knight Welding Supply, and in the background, Justin Hickman of General Sheet Metal Works advises student Dioby Cherisme. The statistics of the program speak for itself. 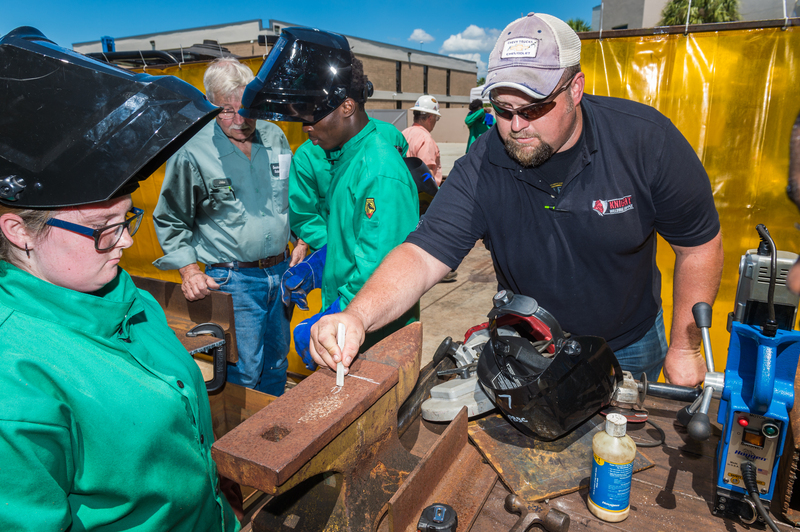 Palm Beach State College has a 100% placement rate for graduates in welding and heavy equipment mechanics, most of which are hired before they even finish the program. In fact, all seven of PBSC’s most recent welding graduates are working in local businesses throughout the Glades Region. They’re from the area, and now they’re living, working, and raising families there. Many of the local employers will even reimburse tuition for qualified students. The initiative has also introduced opportunities to advance the training with programs such as business operations, supervision and management, entrepreneurship, and accounting without even leaving Palm Beach County or PBSC. PBSC dual enrollment welding students Kerry Mullins, Jr., Tamarick Best, Arman Irons and D’aujalonne Scarlett connect a steel beam to two steel columns. From an economic development standpoint, it’s simply a win-win situation. Companies within the trades industry can now gain access to a completely new talent pipeline and students in the Glades Region can get started on their career early. This strategic partnership will not only attract new business and retain top talent, but will open the doors to more successful programs like this in the Glades Region. Successful workforce partnerships help the Business Development Board (BDB) market the Glades Region as an ideal location for businesses. “PBSC’s dual enrollment welding program demonstrates the power of partnerships between industry and education and will help with our business attraction and expansion efforts in the Glades Region,” said Shereena Coleman, BDB Vice President of Business Facilitation and The Glades Region. The program will gain national attention in November 2018 when the college presents this success at the national Association for Career and Technical Education (ACTE) conference in San Antonio, which will educate others about how they can create a similar “I-beam playground” with donated materials like we now have in Belle Glade.